The Davis 2-piece bunk bed set is available in 3 colors and features a slatted design to create a country style appeal. This bed frame is built with insert and lock joint structures to ensure extra safety for your children, as well as side guard railings for the top bunk. The trundle offers added storage or sleeping space with its convenient pull-out design and mobile caster wheels. Product frame is constructed from solid wood and wood veneers. Wipe clean with a damp cloth. Assembly required. Product made in Viet Nam. 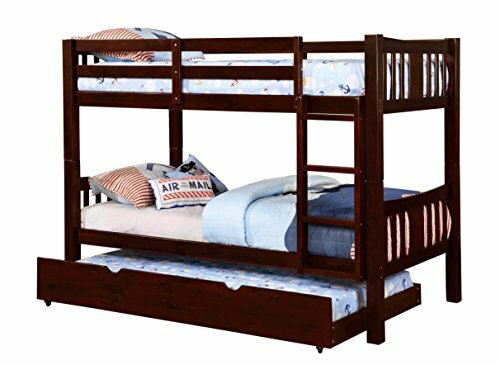 Once assembled, bunk bed measures 81.38 inches wide by 42.38 inches deep by 60 inches high; trundle measures 81.38 inches wide by 42.38 inches deep by 60 inches high; Upper bed clearance: 29 inches; 30-days hassle-free replacement parts warranty. Pictures are for illustration purposes. All décor items are not included in this offer.